October 02, 2018 – The Embraer Phenom 300 delivers the unparalleled class and sophistication you desire for your private travel needs, and Latitude 33 Aviation is proud to welcome the fifth Phenom 300 to its fleet. With a solid white base detailed with charcoal, red and black stripes, this Phenom 300 demands attention on the runway. Voted the best light jet in the world for four consecutive years, Latitude 33 Aviation’s 2017 Phenom 300 (N66M) is ready for takeoff. 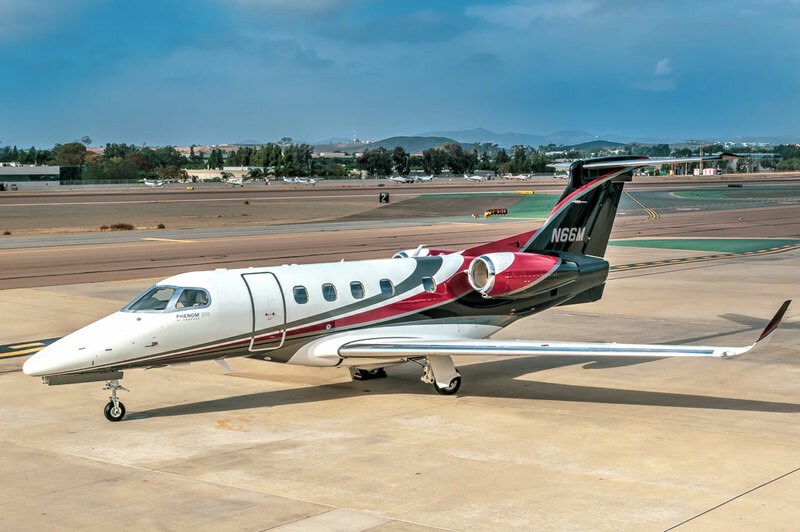 Based in San Diego, CA, this beautiful private jet is perfect for San Diego and Los Angeles Phenom 300 charter flights. Cutting edge technology and a large cabin space create the perfect ambiance for private travelers. The gray leather seating, wood cabinet finish, and gray carpet enhance your travel experience and comfort. Make important business phone calls and video meetings using the in-flight internet access and in-flight phone system. Unique for its class, this aircraft includes an externally serviceable lavatory, sink, and closing door for full privacy. The Phenom 300 holds the best-in-class speed, range, and field performance. Equipped with the Prodigy Touch Flight Deck, the Phenom 300 provides the efficiency and functionality for single-pilot operation. The intelligent ergonomics and outstanding interior design enhance your travel experience. With innovative seats and upper tech panel along the aircraft’s ceiling, every inch of the Phenom 300 delivers efficient travels. This 2017 Phenom 300 is the latest addition to Latitude 33 Aviation’s growing fleet of super-midsize and light jets. A favorite among private travelers, the Phenom 300 can travel from Las Vegas to Toronto, nonstop. From state-of-the-art avionics to its elegant interior, the newest 2017 Phenom to the Latitude 33 Aviation fleet is ready for your next private flight. View our fleet page for additional information about this aircraft. If you need a last-minute trip, we regularly have special one-way deals.